In Lesson 3 we learned that The Tarot Card Deck consists of 78 cards. We learned that these cards are further broken down into 56 cards called the Minor Arcana or Pips (small mysteries) and 22 cards called the Major Arcana (big mysteries). The Minor Arcana is comprised of the 40 cards of the Four Suits (10 in each Suit) plus 16 Court Cards (4 in each Suit). Some decks also have a Blank Card, which will be discussed later in the course. In Part I of Truly Teach Me Tarot we will be focusing our study on the 10 Cards(Ace to 10) in each of the Four Suits (Wands, Cups, Swords and Pentacles) of the Minor Arcana. We will visit the Court Cards in Part II and The Major Arcana in Part III. The Minor Arcana, Pips or small mysteries, is broken down into four different groups each consisting of 14 cards, 10 of which are numbered Ace to 10 with the remaining 4 of each Suit un-numbered. These un-numbered cards are known as The Court Cards. The Minor Arcana is strongly affected and influenced by the the Elements which govern the individual Suits – Wands/Fire, Cups/Water, Swords/Air & Pentacles/Earth. The Minor Arcana is composed of the Four Suits of Tarot and this is where knowledge of the Elements and their associated Zodiac or Sun Sign come into play. While the Major Arcana deal with archetypal energy, spiritual learning, karma and inherent aspects of our self that influence all we do and how we behave, the Minor Arcana deal with the everyday side of things. The flux and flow of life is represented in the Minor Arcana. The Minor Arcana will tell us what is happening, whereas the Major Arcana will tell us why it is happening. The Minor Arcana will tell us what we are experiencing on a day-to-day basis and the situations we get ourselves into. It is through the Minor Arcana the Major Arcana expresses itself. Whatever the Major Arcana wish to express becomes manifest in The Minor Arcana. The Minor Arcana effectively bring to life the often abstract world of the Major as it plays out its driving energy in how we think, act, feel and behave on a day-to-day basis. There are fourteen cards in each Suit. The cards are numbered 1 (Ace) to 10. The remaining four cards in each Suit are not numbered and are known as the Court Cards. The Court Cards are the Page, Knight, Queen and King. The Court Cards represent archetypal characters or personalities. In a reading they can be people surrounding the querant or the querant themself. They are the actors in whatever drama is going on around the querant. The Court Card personalities carry the energies of their particular Suit governed by their Elemental and Astrological Associations. The Court Cards will be covered in great detail in Part II of this course. Before we can think about the Court Cards, we must first get to know each Suit from 1 (Ace) to 10. It is best to approach the Minor Arcana as four individual stories which reflect the personality of the storyteller. By understanding the story behind each Suit we will get to know the cards much easier than viewing them as 40 individual, stand-alone cards. Once you understand how the governing Element and Number of each Suit is likely to affect each card this again assists in the learning process. When we combine the above with a growing knowledge of Symbolism and Colours, much more can be predicted. So let us now explore the nature of the Four Suits and the characters or actors (personalities of the Court Cards) in each Suit who will undertake the individual journeys from Ace to 10. Once you have completed your study of The Four Suits, I do hope that you will have a better understanding of how the governing Element of each Suit and its Number has affected the journey of the characters from Ace to 10. We must always remember that each Suit is represented by a particular Element and its associated energy. Each Element behaves in a certain manner which as we go through the cards becomes quite predictable. You will notice that each Suit appear to be extreme in how they approach life. This is because each Suit behave only in the way they instinctively knows and that instinct is based on the Element that governs them. Their challenge is to find a way to interact with and integrate the energies of each other’s Element in order to find just the right balance of mind, emotions, body and spirit. That indeed is our challenge too? When we then apply Numerology, Colour Meaning, Symbolism and Archetypes to the four personality types we can glean much information from the cards before one traditional meaning is ever looked at. The following four descriptions represent a form of Character Profiling and will greatly assist as you begin to learn the cards. So what are Stage Cards? Stage cards are cards where the scene depicted on the card appear to resemble a stage backdrop. The figures on these cards do not seem to be part of the actual scene but are literally placed in front of it as if they were actors on a stage. You will be able to identify these cards by a certain horizontal line or border that separates them from what is going on in the background. The foreground is plain or flat and generally colourless in comparison to the background. If you let your imagination wander for long enough you can sense the heavy stage curtains and the hushed voices behind the set working hard to make sure the next scene is set up and ready to go. So what does this tell us as readers? Well there are two well-known concepts about Stage Cards. The first one concerns the illustrator herself, Ms Pamela Colman-Smith while the second one is based on the scene depicted in the card being only ‘An Act’. Let us look at Pamela’s involvement first. 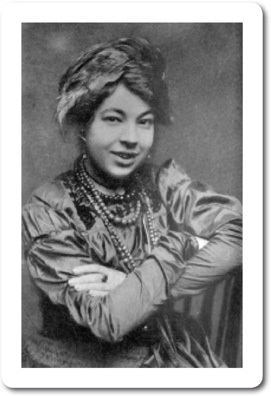 Pamela Colman Smith (1878-1951) collaborated with Arthur Edward Waite to create the Waite-Smith Tarot Deck of today. 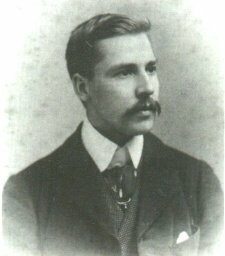 Published Rider in 1909, it is more commonly known as the Rider-Waite-Smith (RWS). Pamela was an artist and writer when Waite approached her to create, under his guidance and instruction, the illustrations for a deck of Tarot he was working on. Pamela at that stage had spent some years as a theatrical designer working on sets and costumes. Many believe that these so-called ‘Stage Cards’ were influenced by her theatrical background. After all she did have 78 cards (she claims 80) to create art-work for and must have called on her direct experiences for inspiration. It is known that Arthur Waite instructed her in the design of the Major Arcana, which has always being considered by many to be the most important part of the Tarot Deck. Pamela was probably left very much to her own devices when designing the Minor Arcana or Pip Cards which up to then had being quite boring, depicting only the symbol of the Suit in varying numbers e.g 6 Swords lined up on a plain background or 3 Cups hanging in thin air. Pamela, a writer and very intuitive too, brought to life the Minor Arcana, and in my belief, is responsible for the wonderful story lines that run through the illustrations of the Four Suits. It is totally up to you as a Tarot Reader to either adopt this concept as you deem necessary when reading the cards or to ignore it altogether. Have a read through it first before you decide. We will be exploring the possible meanings for each Stage Card as we progress through the lessons. When Stage Cards appear, we must look to surrounding cards for verification of what is really going on. Are the figures in role play or character? Are they pretending to be someone they aren’t? Is it all a facade or a mask that is dropped once the curtains go down? Is the situation real or is it only an illusion? If it is an illusion, then why go to the bother? Is someone working hard behind the scenes to create an image to the outside world that is false? Or is it possible that the figures have got so used to, or caught up in the role or character they play, they have lost all sense of reality? Do they actually believe they are the hero, the saintly mother, the devoted husband or wife, or that their marriage is solid? Are they trying to portray the ideal family image of ‘The Brady Bunch’ to friends and neighbours when really they rot from the inside out? The truth is that we can fool many a lot of the time and even ourselves at times but deep down we know the truth. The Tarot will expose it. Often when we do not want to face the harshness of our reality we stick our head in the sand and believe there is nothing wrong. We act out our role every day in order to keep up appearances in front of family and friends. If we are honest with ourselves, we will admit that at times we are all guilty of such pretense. Sometimes it is to keep the peace, to stop people worrying about us, to be liked or even loved. However, if circumstances were dictate to us that we must leave our mask at home for one day, just how recognisable would we be to others? Is our true-self very far removed from the image we project to others. We are all guilty of staging situations and events in our life for the purpose of impressing others. Just think of how we turn the house inside out before visitors call! Social Media platforms are bursting at the seams with ‘selfies’ of people eager to showcase a fantastic lifestyle they want their audience to believe they are enjoying. Some of these ‘selfies’ are natural and spontaneously taken while vast numbers of them are anything but. The staging of such ‘selfies’ is extremely important as the individual wants to give the right impression and for them to depicted in the best possible light. We see ‘selfies’ of fantastic nights out, stunning vacation locations, amazing restaurants and think our life drab and boring in comparison. Like advertisers, the creators of such ‘selfies’ are selling a dream and not reality. The images are contrived and probably much-edited before posting. When we desperately want to hold onto a situation, a relationship, a friendship, a lifestyle, we will go to unbelievable lengths to protect it. We varnish over any cracks or flaws with a plastic smile and a brittle, jolly attitude to pretend either to ourselves or others that all is well. We can go to elaborate lengths to stage and maintain such illusions. 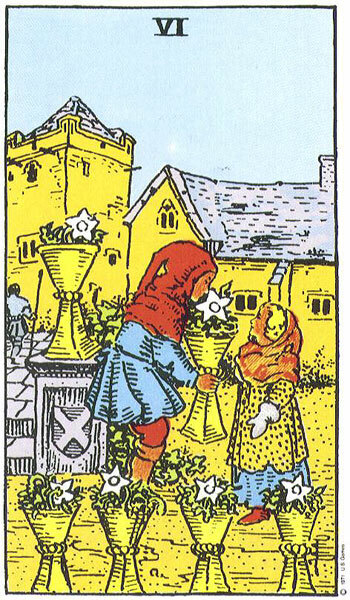 A few examples of Stage Cards are the Two of Pentacles, Six and Ten of Cups. 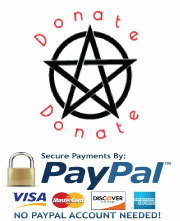 In the Two of Pentacles are we trying to maintain the appearance of financial stability for the sake of others? 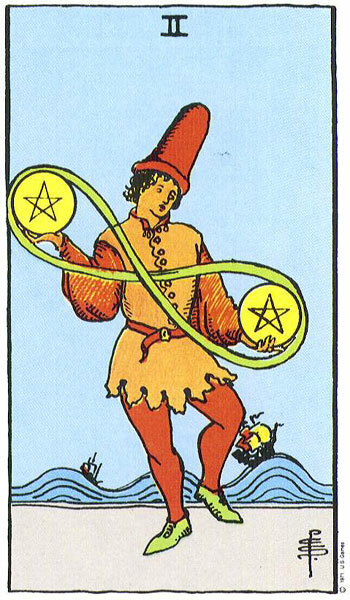 Does the Two of Pentacles demonstrate the family who are determined to appear as though they have everything? The beautiful house, the fabulous decor, the extravagant presents, the exotic holidays? But can they really afford it? How much effort is going in to maintain this illusion? Who are they trying to impress? In the Six of Cups we find the idyllic family set up where everyone is cared for, loved and protected. The family present a united front, go everywhere and do everything together. The parents are seen to dote on their children. The Six of Cups has not so pleasant associations when Reversed. It can highlight sexual abuse within a family unit. Behind closed doors, away from public scrutiny life may be very different. This is also a card of family secrets staying within the four walls of the home, especially if the High Priestess or Moon lies close. The smiling faces in the Family photos may hide a horrible truth. Also, there may be distorted or selective recall of childhood memories. The stage aspect of any card can vary from reading to reading and does not carry just one meaning. When reading you will need to use your intuition to determine how a Stage Card may be impacting the story. 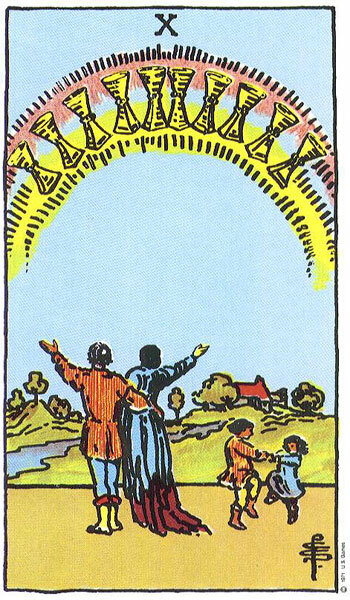 In the Ten of Cups we see the illusion of the happy family. Are they really happy or are they like actors who appear so amazingly friendly to each other and so close when on-screen or stage, but actively detest each other offset? How many times have we been shocked by the evening news or a headline in the paper detailing traumatic and tragic stories of the death of a child or a spouse, under suspicious circumstances, or a murder-suicide? How many times are family, friends and neighbours bewildered by what has taken place under their very noses? “They were so happy”, “no one could have met a nicer family”, “they did everything together”, “they were devoted to each other “, “they had a lovely house, he had a wonderful job and they wanted for nothing” “she was such a good mother”. So what went wrong? Obviously something was going on behind closed doors that no one but the occupants were aware of and no one else to know about. Someone worked hard to to keep it that way and to keep the ‘Act’ up. Depending on surrounding cards, the Ten of Cups can carry the message ‘if it appears to good to be true, it probably is’. The Ten of Cups often comes up as a Stage Card when a querant is being idealistic about a relationship. They may subscribe to the Happy Ever After fairy-tale type of romance. The Ten in such cases becomes an illusion, a fantasy. They may be looking for a perfect partner, perfect relationship that rarely exists, or are so consumed with getting married and starting a family will rush a relationship that is not yet ready to progress. Stage Cards appearing in a spread may alert you to pretense, a facade, a public image or an idealistic view of the querant’s life. Note, the presence of a Stage Card in a reading does not automatically point to an ‘act’ or ‘pretense’. A Stage Cards is only a Stage Card when surrounding cards do not support the depiction portrayed, or when the querant’s story does not gel with the meaning or imagery. Other than that it is a normal card and should be treated as so. Tarot Students can get drawn into the drama of tarot cards so tread carefully. Remember, the majority of time Stage Cards will be read as normal cards. A Stage Card that seems out-of-place with the remaining cards in a spread may however need further investigation and a softly, softly approach with the querant. As you become more experienced as a card reader, you will begin to ‘smell’ when something is not right. Just because the querant is sitting in front of you seeking advice does not mean they are actually ready to take that advice. In fact the querant may have so many blind spots and has been living the lie for so long that even they do not know where the lie ends and the truth begins. The lines can become very blurred indeed. 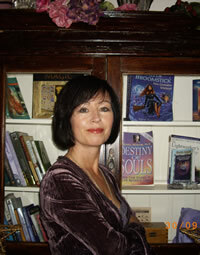 It is your job as a Tarot Reader to become increasingly observant of those you read for. The additional lessons taught throughout this course in relation to ‘tuning in’ to the querant and learning how to sense energy is all part of the process. It is not enough to just read off the cards in front of you. So many other things must be taken into consideration to get an overall impression of the situation at hand. Remember, that many people who come for a reading expect all Tarot Readers to be telepathic and clairvoyant. They may be reluctant to speak of their deepest fears or insecurities but will expect you as the Tarot Reader to uncover them and then tell them what to do. As a reader you cannot be responsible for every such situation as that would be impossible, but to develop as a unique and respected Tarot Reader you must at least be aware of such possibilities and endeavour to develop your reading skills to the best of your ability. People go to Tarot Readers for help, assistance, guidance and direction. Some of these people just go for a lark and it is very easy to spot when this is the case as they find it difficult to zoom in on any particular area they need insight in. They are vague and their readings often reflect this. It is the person who has real concerns that will call on your services and arrive quite apprehensive, and even tearful. These people generally have a very specific request and are extremely focused. They listen attentively and even write down certain comments. Just because they are focused does not guarantee they are not blind to what is going on around them or living a pretense. Many people get into a habit of pretense, are not even aware that it is going on, and often find it hard to break out of. 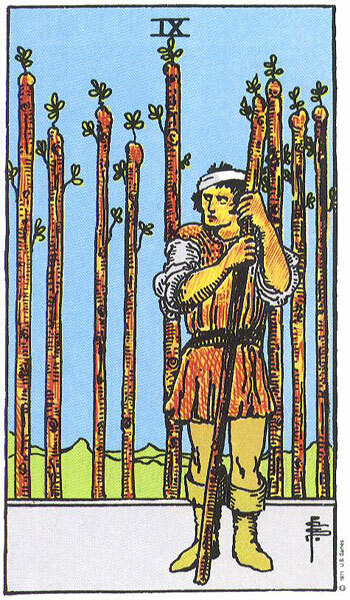 Another example of a Stage Card is the 9 of Wands. The figure stands guarding eight wands while leaning on the ninth. He looks nervous and anxious as if waiting to be attacked. He may be convinced enemies are at the door waiting to take his wands from him. Is this really the case? Are there any enemies at all? Is anyone interested in his wands? Has he got something real to fear or is it all in his head. Is he paranoid? Surrounding cards should show support if there is a real threat. It is a good exercise to go through the Four Suits and view them meticulously. Search for the Stage Cards and ask of the cards you have studied so far what the images are depicting or possibly concealing. Try it with the cards you haven’t covered as well to see if you can come up with any ideas. NB ***you must remember that in 95% of cases there will be no façade going on at all , the card merely demonstrating what is happening in the querant’s life. Viewing all the cards in a reading and communicating with the querant will bring clarity as to whether a Stage Card is Active or Not. Being aware of the Double Aspect of Stage Cards can often help make sense of a confusing reading. The challenge here is to be intuitive and observant enough to realise when a Stage Card is being active or not. Thank you so much.. This course is really helping me to understand the cards on much better way i ever anticipated. Delighted Nupur that you are getting better understanding of the Cards. There is plenty more to come. Thank you Vivien lovely. I can’t believe that you shared so much invaluable knowledge with the world!! Now I am following the course. In Lesson 4, I learned about the basics of four suits of Minor Arcana and what the stage cards are. I am delighted that you are learning so much from the course and there will be a lot more to follow. I am working hard at writing up more content for all of you as there is still much more to do. Thank you so much for your lovely message. I am delighted you are using my site and content to help find guidance for yourself and for others. If you keep up your studies of tarot through my site and other free sites online, you could be in a position to earn a living or part living from reading for others. You are being proactive in gaining the knowledge you need and will be rewarded for your effort. The very best of luck with your ongoing studies and do let me know when you have taken your first paying client.